On Friday 27 May 2016, at the Tsuglakhang temple in Dharmsala, Lobsang Sangay was sworn in for a second term as prime minister of the Tibetan government-in-exile. In his speech, Mr Sangay declared his intention to devote himself to achieving regional autonomy for Tibet during his five-year term. What’s more, he uncovered his “five-fifty” plan, a shot and long-term strategy in which the government will continue to advance the Dalai Lama’s vision of greater autonomy for Tibet from mainland Chinese rule. Lobsang Sangay was sworn in for his second term as prime minister of the Tibetan government-in-exile Friday (27 May 2016) and said he will make maximum efforts to achieve regional autonomy for Tibet during his five-year term, but will prepare a strategy for the next 50 years if it's unsuccessful. Hundreds of Tibetans filled the compound of the Tsuglakhang temple in northern India's Dharmsala, the hill town that has been the headquarters of the government-in-exile, where the oath-taking ceremony took place in the presence of the Dalai Lama, the spiritual leader of the Tibetans. They clapped when Lobsang Sangay arrived with his wife and daughter and greeted him with ceremonial white silk scarves. Sangay prayed and prostrated in front of the statues of Tibetan deities before he went to receive the Dalai Lama at his residence near the temple compound. "In the next 50 years China will change. It has to change. And then Tibetans will get their basic freedom. We need to strategize in order to strengthen and sustain our cause for the next 50 years," Sangay said in his speech. He called his long term strategy "five-fifty," where his government would make every effort to achieve the Dalai Lama's stated goal, of greater autonomy for Tibet under mainland Chinese rule, during its five-year term but prepare for the next 50 years. "I stand in solidarity and express my sincere appreciation for the patriotic fervor that continues to burn in Tibet," said Sangay. He said that the sacrifices made by 144 Tibetans who have immolated themselves protesting mainland Chinese rule since 2009 "will not go in vain." Sangay prostrated in front of the Dalai Lama before beginning his address. He also apologized to the religious leader of the Tibetan Buddhists for not meeting the high moral standards set by him during the election campaign. Sangay was referring to bitter comments made by the prime ministerial candidates as they looked for support among Tibetan settlements across the diaspora. "There have been a series of unfortunate events that went counter to the Tibetan tradition of humility and good conduct. This has greatly saddened and disappointed His Holiness the Dalai Lama. 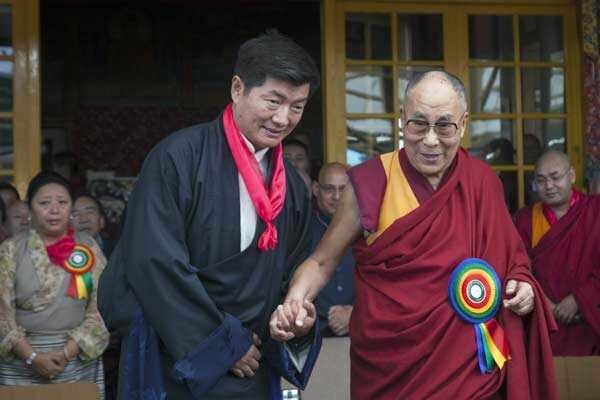 We ceaselessly beg His Holiness the Dalai Lama for his forgiveness," Sangay said. Tibetan exiles across the world voted to re-elect Sangay to a second term in March. The results were announced last month. Both Sangay and his main rival, the speaker of the Tibetan Parliament-in-exile, Penpa Tsering, both supported the "middle path" proposed by the Dalai Lama, which seeks regional autonomy under Chinese rule. Some groups have been advocating full independence for Tibet as little progress has been made in the dialogue with mainland China. Mainland China says Tibet has historically been part of its territory since the mid-13th century, and the Chinese Communist Party has controlled it since 1951. But many Tibetans say the region was effectively independent for most of its history.